JFK’s daily activities were recorded in detail in the president’s daily diary. 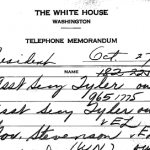 The White House switchboard kept a detailed log of President Kennedy’s incoming and outgoing phone calls. Here are some of the original, handwritten logs. 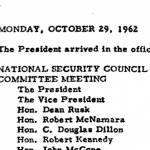 Want to see when RFK met secretary of Soviet Ambassador Anatoly Dobrynin during and after the Cuban Missile Crisis? 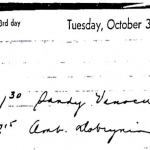 Here are scans of RFK’s appointments diary for October through December 1962. 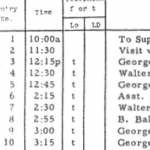 LBJ’s secretaries kept careful records of the vice president’s day, including who he met with, who he spoke with on the phone, and sometimes even what he had for lunch.